Join the discussion on our forums! Come discuss Security Rover over in our dedicated Security Rover discussion topic. I love the golden animation for this thing. It's a pity that it's not worth including in any decks. Still, it can be a decent discover from Omega Assembly and Delivery Drone under the right circumstances. little pricy but it's decent if you throw in 2 WW effects. One important thing to note is that it summons the 2/3 even if it dies to damage. 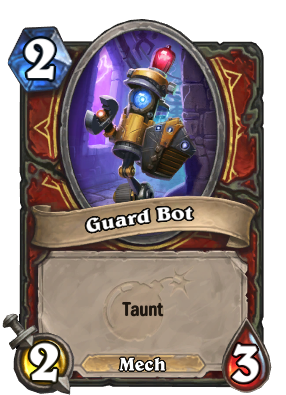 You need to have it make two Guard Bots to be worth playing. This is more likely to be a mid-range answer to aggro which means it is not really worth playing currently as far as we know. Though I get the idea that Blizz wants to go with which is using Magnetic to get more value out of this card. It is just a bit too weak standalone at that mana cost. Christ what a worthless card. At least the artwork is pretty decent. Bet the artists had fun making the golden animation. It looks pretty cool but only magetic might make it playable imo. 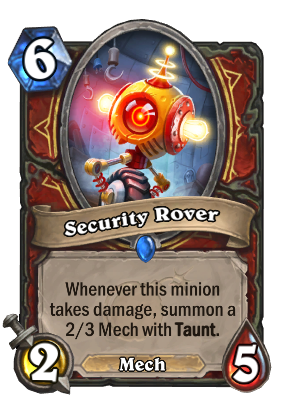 This card obviously is garbage on its own, it is supposed to be used alongside magnetic minons. Well, if you use this and Whirlwind on turn 7, you will have 2 bodies, 2/3 with Taunt and 2/4. It’s 4/7 with Taunt for 7 mana and 2 cards. Pretty weak. This card is too slow. If it would cost 5-mana, it’ll be much better, maybe even OP, but for 6-mana it will hardly see any play. Maybe to combo it with effect of Dr. Boom, Mad Genius, at last.